makes a BartPE CD with 5 Tools to help you recover from a WinXP and Win2000 crash: Crash Troubleshooter - steps you through what can cause a crash and tells how to fix it; Drive Explorer; WinRescue Crash Fixer - a reproduction of WinRescue's Crash Fixer section for restoring WinRescue backups; Restore WinXP Restore Points; Unzipper and Extractor. Please see our website for details - www.xp-recovery-cd.com. XP Recovery CD Maker 1.01.11 is a shareware program and can be used as a demo to try the software until the free trial period has ended. A full version of the program is available after the trial period ends. For security reasons, you should also check out the XP Recovery CD Maker download at LO4D.com which includes virus and malware tests. Additional screenshots of this application download may be available, too. 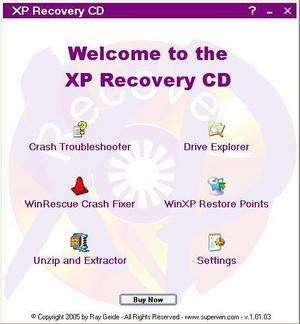 XP Recovery CD Maker has a presence on social networks.